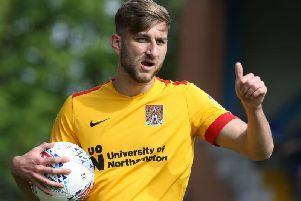 George Cox is set to be the only injury absentee as the Cobblers prepare for Saturday’s Sky Bet League Two clash with Exeter City at the PTS Academy Stadium (ko 2pm). Defender Charlie Goode was forced off towards to end of last Saturday’s 2-0 win at Crewe Alexandra after suffering a facial injury, but manager Keith Curle has confirmed the Scunthorpe loan man will be available. Fellow defender Shay Facey, who hasn’t featured since the 1-1 draw at Lincoln City on February 9, is also fit and available again, but Brighton loanee Cox is set to be sidelined for another two or three weeks due his injured ankle. Curle said the rest of the squad, aside from Cox, is in good shape, and that situation can only be good for the club. “There is good competition within the squad, and when it comes to team selection the players know there is nothing guaranteed,” said the Town boss. Curle went on to give some encouraging news on Cox’s recovery. The left-back suffered his ankle inury following a late tackle in the 3-2 defeat at Cambridge United back on January 12, and there were fears he may be out for season. But it now seems he could be available again by the end of March, with Curle saying: “George went down to see a specialist in London and got some good news. “They had the potential of two options with the ligament damage, and they have gone for the first option which is the shorter option. “We are hoping that George is on his way to recovery. I think he is going to spend two weeks down at Brighton, and then he will hopefully be back up here with us. “Then he can hopefully start his field-based training with us and be back involved in the squad in the near future.